It was a beautiful day for a walk, sort of a preemptive strike before the excessive caloric intake to come later in the afternoon. I took these photos with my iPod, because I didn’t feel like weighing myself down with the big camera. 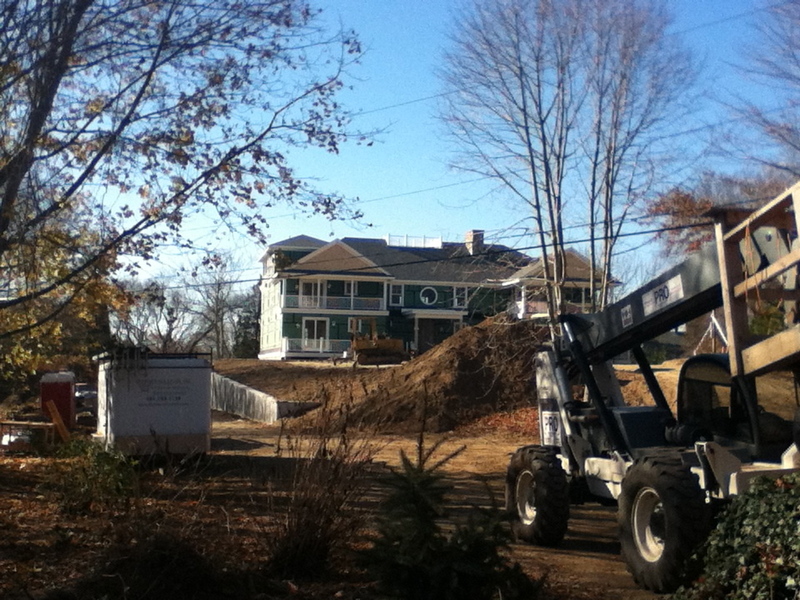 On my way to the beach, I passed yet another ridiculously big (and out of place) house being built. These behemoths are destroying the neighborhood. Look carefully at the center of the above photo and see the dot that is a man swimming. 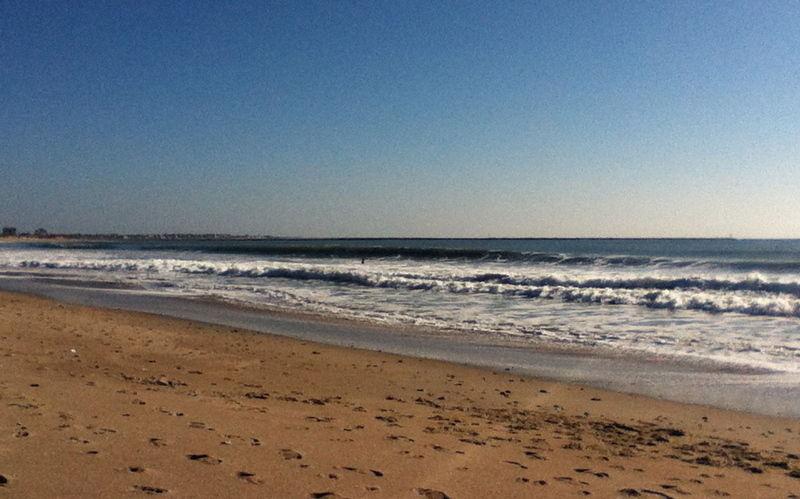 He was wearing a wetsuit, and it looked like he was having a blast in the waves. 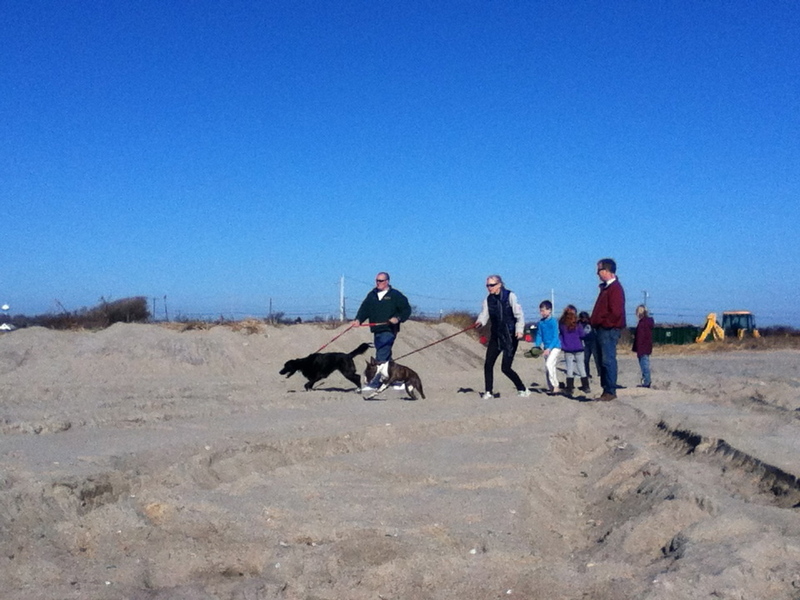 Dogs kept arriving with their families, delirious to be on the beach. I wonder of these dogs have ever seen a beach before. They sure were excited. Here’s a shot looking back at the parking lot. 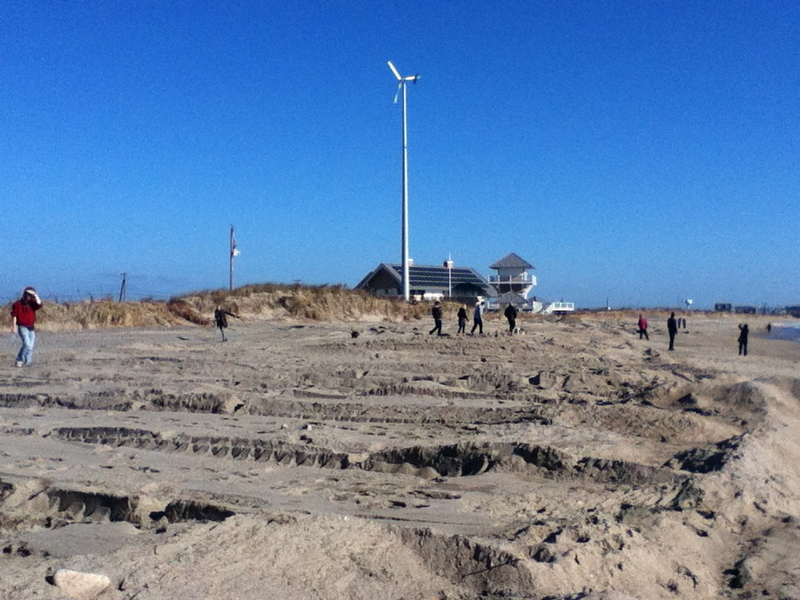 They are still shoveling up all the sand that washed over during Hurricane Sandy and pushing it back on the beach. 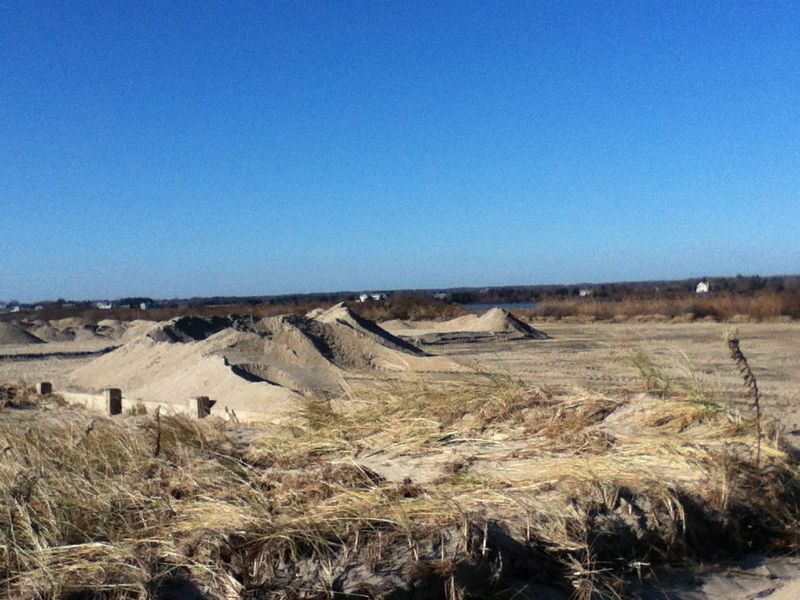 And here’s some of the sand that’s been returned to the beach. It’ll take a while to settle and pack down. I had to take a picture of one of our neighbors’ trees, a locust. 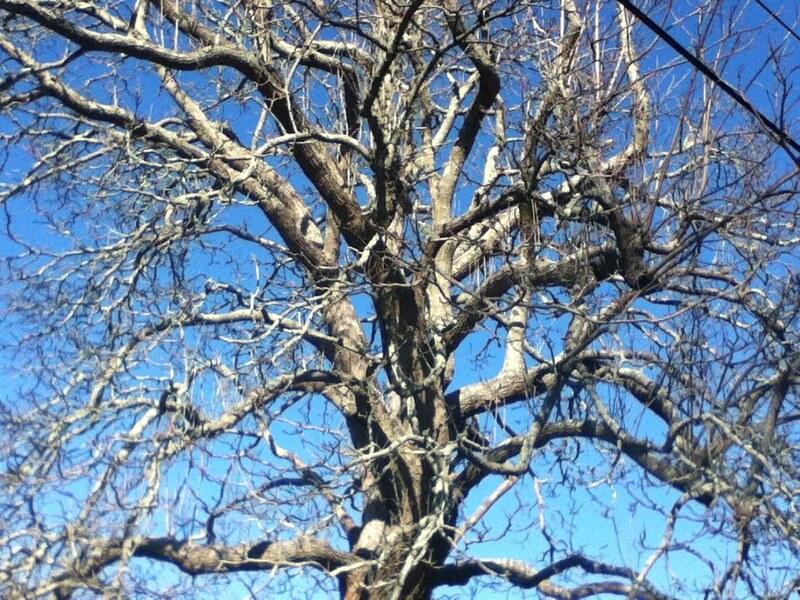 The branches looked really gnarled in the November light. Happy Thanksgiving to my American readers, and best wishes and sincere thanks for reading to my friends in other countries. Lovely photos. I am fascinated by that man swimming in the water. I’m cold just thinking about it, but if he’s having fun, then more power to him! Happy Thanksgiving! Do you celebrate the Canadian and American holiday? Lots of good food! Martha, remember the water is not that cold yet (60 F average), and he was wearing a wetsuit, so he was not even slightly chilly. You had a gorgeous day for the holiday, dn. We did, too. And a beautiful, clear night. It’s good to see that the beach is being repaired. Here’s to a fantastic holiday season to you and yours. For now, no matter how much damage nature does to beautiful places, it leaves enough beauty to make a walk a beautiful thing. great pictures….although I know that most dogs love to watch the waves and walk the beach…and this is fine…but…hope the owners are responsible and pick up the “poops”…hate to be a party pooper but the thought of dog poop on the beach is nasty. Hopefully they have signs posted …people like to enjoy the beach too…grew up on the beach, was a lifeguard etc…and that was a pet annoyance of mine for sure. Happy Thanksgiving and Merry Christmas to all…..